Mike and Mike talk about a New York City legislator who is pushing to expand electronic editions of textbooks to help defray high costs for college students. New York, NY – With Governor Paterson proposing that New York’s public universities be allowed to freely raise tuition, opening the floodgates for cash-strapped colleges to hit students with big bills as they scramble to overcome cuts to tuition assistance, Assembly Member Micah Z. Kellner (Upper East Side D, WFP) released a report today showing that electronic resources have the potential to bring down the cost of higher education for low- and middle-income families struggling to put their kids through college. Entitled, "Transforming Textbooks: How Electronic Textbooks Can Reduce Costs and Expand Academic Resources in Our Public University Systems," Assembly Member Kellner’s report demonstrates that electronic textbooks have the potential to take a big bite out of the more than $1000 that public college students spend per academic year on required texts, making the case that the digital revolution provides a critical opportunity to save money for New Yorkers—but warns that the publishing industry’s current business practices stand directly in our way. The full report is freely available from Assembly Member Kellner's website. 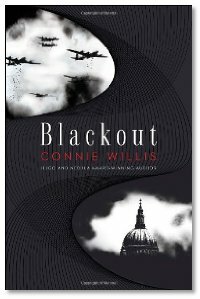 Interview: Connie Willis' latest novel is Blackout, and it's actually just the first half of the story. Blackout: All Clear is the concluding volume, and is due out in October 2010. Connie tells the guys about some of the little-known stories that came out of the London Blitz, how she prefers to examine the human elements surrounding the disaster stories throughout history, and how she prefers science fiction over historical fiction as a platform to tell these tales.